Mario Draghi, the European Central Bank’s president, said ECB looser monetary policy is possible if the euro continues to strengthen and the Eurozone’s inflation rate drifts further away from its 2% annual target. Monetary policy refers to what Central Banks do to make sure the economy is moving in the right directions. If things are sluggish they will adopt an expansionist monetary policy, and a contractionary one when the economy overheats. One of the main reasons inflation in the Eurozone is so low is the euro’s rising value against other major currencies. The Eurozone’s current 0.5% annual inflation rate is declining dangerously close to tipping the whole region into a prolonged period of damaging deflation. At the International Monetary Fund’s spring meeting in Washington D.C., Mr. Draghi gave indications that the large-scale purchase of financial assets, known as Quantitative Easing (QE), are measures he and the ECB are considering. Earlier in April the European Central Bank voted to keep its benchmark interest rate at a historic low of 0.25%. Draghi emphasized that the ECB Governing Council members were ALL ready to initiate QE if inflation continued well below their 2% target for a prolonged period. The ECB says it will do whatever is needed to prevent a deflationary recession. If inflation is very low for a long time consumers put off their spending because they expect prices may fall later on. As consumer spending falls so does business revenue. Consumers and businesses borrow less, spend less, resulting in an economy that slows down, and possibly slides into a recession. In periods of very low inflation or falling prices (deflation) individuals, businesses and governments find it harder to pay off their debts. If your salary does not rise (or even falls), your monthly debt repayment installments do not go down as a percentage of your income, and could even rise if wages are cut. Most experts believe the ECB would first opt for a further cut in its 0.25% benchmark rate before implementing any US Federal Reserve style stimulus program. The ECB’s Governing Council recently aired the idea of reducing the benchmark rate to below zero, or charging banks that hold excess cash with the central bank. The Euro has risen 5.5% against the US dollar and almost 10% against the yen over the last 12 months. 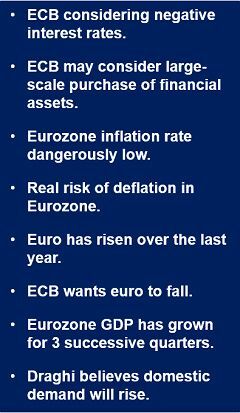 If the Eurozone’s currency continues to gain, such measures may be required, Mr. Draghi said. The strong euro is responsible for a (minus) -0.5 percentage point in the region’s annual rate of inflation. In other words, if the euro had been falling against the dollar over the last six or 12 months, inflation in the euro area would be about 1% per year (and not 0.5%).